One of the truly amazing Canadian wine success stories is Coffin Ridge on the shores of Georgian Bay. Neil and Gwen started in 1999 and have done amazing pioneer work with cool climate grapes. They were smart enough to hire Steve Byfield (Nyarai Cellars) as winemaker and labels such as ‘Back from the Dead’ and ‘Into the Light’ suggest a healthy dose of humour. Check out the Vintages offering below. 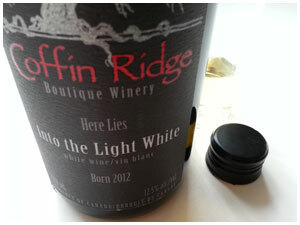 ‘Into the Light’ is a light-bodied, crisp white with pure flavours similar to Muscadet from France. Not a wow, but a solid house wine with spring-day freshness. So get some and celebrate the season – and explorer wineries. How do you make good wine that far north? You grow winter-hardy grapes such as the ones in this blend: Geisenheim, L’Acadie Blanc, Frontenac, Prairie Star and Riesling.